The next meeting of the Wealden Astronomers will be at Herstmonceux Village Hall on Friday 5th April 2019 at 7.00 for 7.30 PM. The next meeting of the Wealden Astronomers will be at Herstmonceux Village Hall on Friday 5th April 2019 at 7.00 for 7.30 PM - Tea, Coffee & Biscuits. The speaker for this evening will be John Fox on Astro Photography. This will be followed by a presentation of the members latest images. Chris Ellis will be giving a short illustrated talk on this month's night sky. If the skies are clear there may be opportunity to get your telescopes out in the car park. 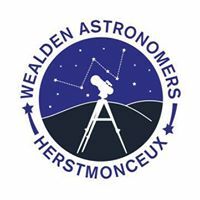 The next meeting of the Wealden Astronomers will be at Herstmonceux Village Hall on Friday 1st February 2019 at 7.00 for 7.30 PM - Tea, Coffee & Biscuits. Chris Ellis, will be giving a short illustrated talk on this month's night sky.